I saw this recipe in a food magazine sometime ago. I thought it looked promising because it's light and easy to make, and also very healthy as it's full of vitamin C. So I decided to try it out. In the original recipe they use creamy yogurt, but I opted for a more dietetic fat-free yogurt. Doesn't it look pretty? It was very fresh and tasty, altough I have to say that it would have been as good even without honey since the oranges are sweet enough. This recipe suits well as snack or dessert. Peel the oranges off all the white skin and cut them horizontally in thin slices. 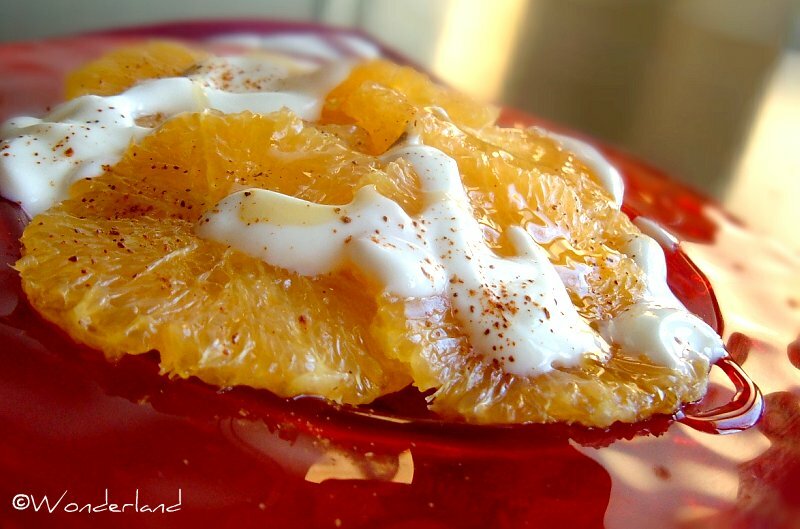 Lay the slices on a serving plate, sprinkle them with cinnamon and pour yogurt and honey on top. we use to eat something like this especially on new years eve. You cut the slices as on your picture and dispose them on a plate, put Moscatel over the slices (sweet yummy alcoholic beverage) and then the cinnamon.